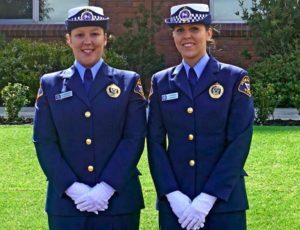 Two women graduated at the top of the class in Tasmania Police’s final recruit graduation in 2017, our 100 Years of Women in Police. Twenty-three-year-old Abbie Weidinger was named Dux and 23-year-old Josie Crowden was awarded Runner-Up Dux at the graduation ceremony of 19 new Constables on 15 September 2017. Abbie headed to Burnie with five of her fellow graduates, while Josie has begun her career in Hobart with eight of her fellow graduates. Course 1/2017 is the only recruit course to start and graduate in this milestone year for Tasmania Police. For the first time in history, the flag party at the graduation ceremony – led by Inspector Kathy Bennett – comprised all female members. “We’ve come a long way in supporting gender diversity in Tasmania Police over the past century. In this course, nine of the 19 graduates are women,” said Commissioner of Police, Darren Hine. The 19 Constables completed 28 weeks of rigorous training at the Tasmania Police Academy, Rokeby, and three weeks of practical experience in various stations around the state. “As a special guest for the 100 Years of Women in Police celebrations, we welcomed retired Inspector Lyn Jones APM as the Reviewing Officer at the ceremony,” said Mr Hine. Lyn enjoyed a long and distinguished career with Tasmania Police until her retirement in 2008. “Lyn was only the third Policewoman to reach Commissioned Officer status when she was promoted to Inspector and has offered many of her colleagues and peers professional guidance, support and encouragement during her 30-year career. “The career of a police officer is rewarding and varied, and we wish our new graduates well as they forge their own paths within the service,” Mr Hine said. Above: Constable Abbie Weidinger (Dux) and Constable Josie Crowden (Runner-Up Dux) of Recruit Course 1/2017. This page -- https://www.police.tas.gov.au/about-us/100-years-women-policing-tasmania-police/recruitment-and-training/women-top-recruit-class-milestone-year/ -- was last published on January 23, 2018 by the Department of Police, Fire and Emergency Management.